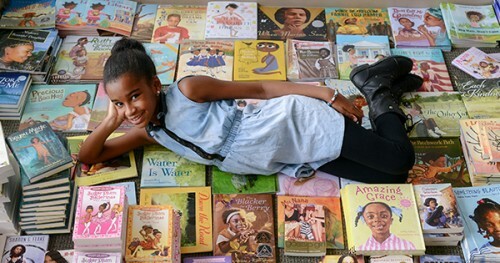 Marley Dias, the young girl who launched the #1000BlackGirlBooks movement to collect children’s books featuring Black protagonists, will be honored this year at the 2016 International Pretty Brown Girl Day celebration at Spelman College in Atlanta, Georgia with the Dream Big Award. Photo: Andrea C. Mecchi The Pretty Brown Girl (PBG) Movement represents girls everywhere that are enlightened, empowered, and encouraged to live life to their fullest potential, while loving the skin they are in. At the event this year, Marley will be honored with the Dream Big Award alongside two others. Their theme is "Empower a Girl, Empower the World”, where they will highlight the importance of girls in our communities seeking higher levels of education, excellence and expectancy. If anyone fits this description, it's Marley. In an era when #WeNeedDiverseBooks trends, and Lisa Lucas is named as the next executive director the National Book Foundation, the demand for diversity in literacy is aiming to change the dynamic of the publishing industry. For little girls like Marley, reading only about white boys and dogs in her school was simply not going to cut it. "I understood that my teacher could connect with those characters, so he asked us to read those books," Marley said, "But I didn't relate to them, so I didn't learn lessons from those stories". And Marley connected the dots; if she was going to get more books with Black girls as the main characters, everybody should get it too, because sharing is caring. The media caught wind of her social action movement, and she's been featured on The Nightly Show with Larry Wilmore as well as The Ellen DeGeneres show where she received a $10,000 check from Shutterfly and a laptop. Not only did Marley meet her goal of collecting 1,000 books, she exceeded her goal by collecting close to 1,300 books!